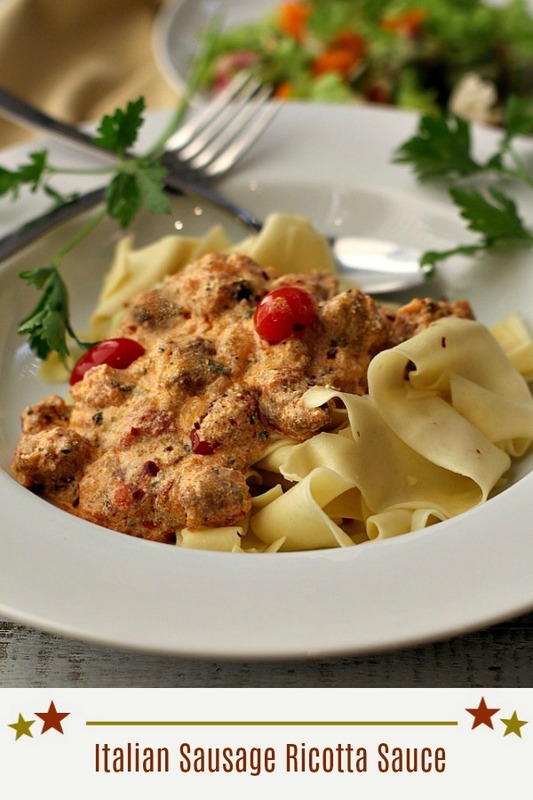 This is a recipe for ricotta pasta sauce made with nothing more than ricotta cheese, Italian Sausage and tomatoes. Plus some Italian seasonings and a little bit of Parmesan of course. It’s most delicious if you keep the pappardelle pasta slightly al dente and topped with just enough sauce and some grated Parmesan and red pepper flakes. For best results use good quality noodles and quality whole milk ricotta cheese. I know what you’re thinking: It’s about time she gave us more main course pasta recipes. 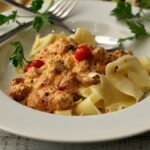 Within one of my favorite food categories on my site, “Main Dish Pasta”, you’ll find only 23 recipes. Compared to 67 in the chicken category and 67 in the seafood category. Seafood? 67? Really? And I’m landlocked for pitty sake. This is a ricotta sauce recipe that I’ve had in my database for maybe twenty years. It’s a recipe that I took camping one year. We used to gather with our neighbors at many pristine Colorado camp sites and cook, hike, play games and in general enjoy our amazing Colorado scenery. With two main meals a day, breakfast and dinner, we’d take turns providing camp grub for the crowd and as you can imagine, we ate very well. One of my favorite gourmet camping trips was this one, Camping Pearl Lake, where I still insist that we should have received a James Beard Award for camp food. One year my contribution to feed the crowd was this ricotta pasta. I can’t exactly remember, but surely I must have prepared this ricotta sauce at home to reheat at the campsite and serve over pasta which was cooked on site. Everyone loved it so much that it was requested again and again. And it makes me hungry just writing about the recipe. If you’re looking for recipes using ricotta cheese I’m strongly suggesting you give this one a try. Just cook the Italian sausage and discard most of the excess grease. I l leave just a little for flavor. Add onion, garlic, tomatoes, lemon juice and seasonings and cook for twenty minutes. Cook your pappardelle pasta and then top with the ricotta pasta sauce. I hope you give this Ricotta Pasta Sauce a try. And if you do, please come back and let me know how you liked it and give the recipe a star rating. Your feedback is valuable to me for developing future recipes. And if you have a favorite ricotta sauce recipe, let me know, I’d love to give it a try. 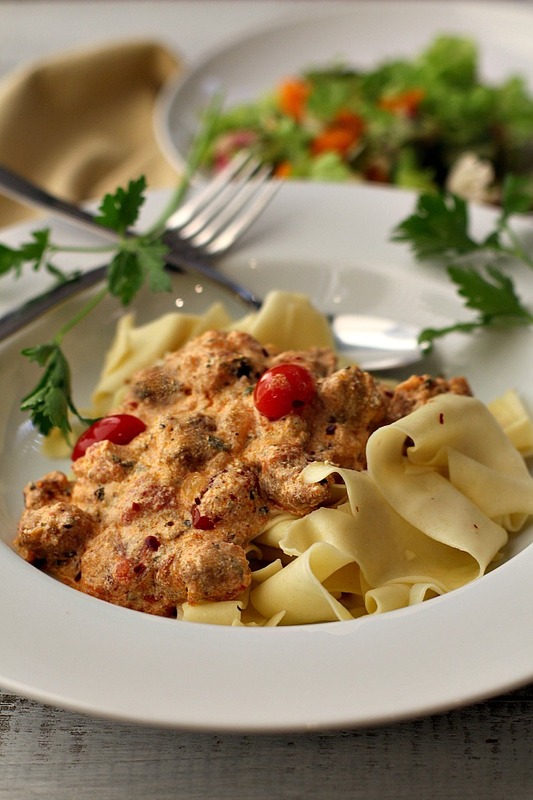 And, don’t miss the most popular pasta recipe on my site: Spicy Creamy Shrimp Pasta. In a large skillet, heat olive oil. Add sausage and cook until lightly browned. Drain access greese. Add tomatoes, onion, garlic, lemon juice, fresh herbs and 1/2 cup water. Season with salt and pepper. Cook until the sauce is thick, about 20 minutes. Stir in ricotta and remove from the heat. Optional: Add some halved cherry tomatoes for texture and color. Cook pasta in a pot of boiling salted water until al dente (about 8-10 minutes). Rinse and drain. 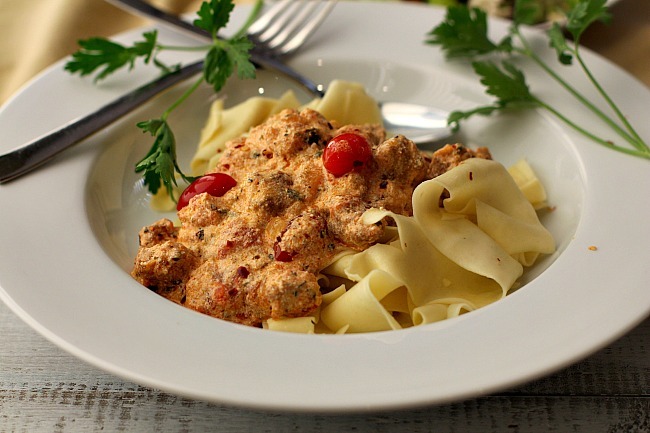 Serve sauce over individual plates of pasta. Top with grated Parmesan cheese and red pepper flakes. I’m sharing this Ricotta Pasta Sauce recipe over at Southern Plate’s Meal Plan Monday. Love Italian sausage! Such a great flavor. Oddly enough, I don’t often use it in a pasta sauce. This looks excellent — tons of flavor, and a great way to use fresh summer tomatoes. Thanks! While I’ve not made a ricotta sauce, I’ve made a sausage ragu for pasta and topped it with dollops of ricotta cheese. It is a favorite of my husband so I know he would enjoy your sauce. I made a sausage ragu at Culinary School. And dying to make it at home. So good. Love this sauce, looks delicious ! Im following you ! Hi Gloria. Thanks so much and thanks for the follow.